Roasted Whole Chicken makes a nice treat any day and on every occasion but the fear of messing it up keeps a lot of people from preparing this yummy recipe. The most important thing you need to do when roasting whole chicken is to make sure that the chicken is thoroughly seasoned. There are many types of seasoning and vegetables you can use for your roasted chicken and there a many ways to go about it but the method detailed on this page is how my Mum does it! I use rooster or cockerel which is the male chicken because it is softer and cooks quicker than hen, the female chicken. Even though hen is tastier, it will take much longer to get done if you use it for this recipe. I only add ground ehu seeds to give the chicken a sort of barbecue/peppersoup flavour. Feel free to use other seasoning you like. You can experiment with other herbs, seasoning and vegetables. It is not advisable to use soft vegetables because they will be overcooked by the time the chicken is done. You can skip the potatoes and use only rice. Just parboil the quantity of rice that will be enough for the stuffing and side dish. Cover the rice with aluminium foil so that it will not be dry when done. Prepare the blend of seasoning for the body of the chicken by mixing the dry ground pepper, stock cube (crushed) and ground ehu seeds. Scrape and cut the carrots into small cubes and cut the onion into small pieces. Peel and cut the potatoes into wedges. You can leave the skin on if you want. Parboil the rice like you would parboil rice for Nigerian Jollof Rice. Rinse and put in a sieve to drain. If you will be using only rice as your side dish, you will need to parboil enough rice for this purpose. Put it in a bowl, add the curry powder and mix well. Add the diced carrots, green peas, diced onions, thyme, salt to taste and some vegetable oil. Stir well and set aside. Wash the chicken and dry with a towel. Stuff the inside with the seasoned rice and vegetables. Do not over fill it because remember that this rice is only parboiled and it will rise as it cooks. When done, tie the legs of the chicken. This helps the chicken maintain a more presentable shape. You don't want it sagging and all over the place. Set your oven to 180°C (350°F) to preheat. Rub some vegetable oil on the chicken, sprinkle the blend of seasoning we prepared earlier and rub it all over the body of the chicken. Make sure the chicken's wings are tucked away under the chicken or into the string you used to tie up the chicken. If you want to use only rice as your side dish, then you should have prepared enough in step 1. If using potatoes, place the wedges in a bowl, add the remaining seasoning from the one you rubbed on the body of the chicken, add thyme, salt to taste and some vegetable oil. Toss to evenly distribute the seasoning and set aside. Dish the remaining rice from the stuffing into an oven tray leaving some space at the centre for the chicken. Place the chicken at the centre. 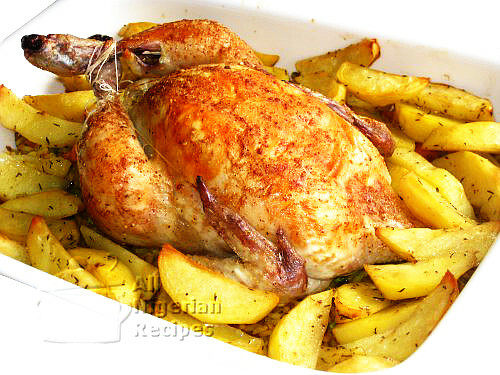 Add the seasoned potatoes around the chicken and place in the preheated oven and bake for one and a half hours. The chicken is done when it is golden, the rice inside the chicken is well done and a cut into the chicken thigh shows a white flesh with some succulent juice. If the skin is pinkish or even red, the chicken is not done. That's it! It's not that hard after all, is it? Serve portions of the chicken with the rice and roasted potatoes.